Roman law is the legal system of ancient Rome, and the legal developments which occurred before the 7th century AD - when the RomanÐByzantine state adopted Greek as the language of government. The development of Roman law comprises more than a thousand years of jurisprudence - from the Twelve Tables (c. 439 BC) to the Corpus Juris Civilis (AD 529) ordered by Emperor Justinian I. This Roman law, the Justinian Code, was effective in the Eastern Roman (Byzantine) Empire (331-1453), and also served as a basis for legal practice in continental Europe, as well as in Ethiopia, and most former colonies of European nations, including Latin America. Historically, "Roman law" also denotes the legal system applied in most of Western Europe, until the end of the 18th century. In Germany, Roman law practice remained longer, having been the Holy Roman Empire (963-1806); thus the great influence upon the civil law systems in Europe. Moreover, the English and North American Common law also were influenced by Roman law, notably in the Latinate legal glossary - stare decisis, culpa in contrahendo, pacta sunt servanda. In contrast, Eastern Europe, though influenced by the Byzantine Empire, was not much influenced by the jurisprudence of the Corpus Juris Civilis; however, they did accept the Roman influence of the Farmer's Law. Before the Twelve Tables (754-449 BC), private law comprised the Roman civil law (ius civile Quiritium) that applied only to Roman citizens, and was bonded to religion; undeveloped, with attributes of strict formalism, symbolism, and conservatism, e.g. the ritual practice of mancipatio (a form of sale). The jurist Sextus Pomponius said, "At the beginning of our city, the people began their first activities without any fixed law, and without any fixed rights: all things were ruled despotically, by kings". It is believed that Roman Law is rooted in the Etruscan religion, emphasizing ritual. 4. If one is mad but has no guardian, the power over him and his money shall belong to his agnates and the members of his gens. 2. If one has maimed a limb and does not compromise with the injured person, let there be retaliation. If one has broken a bone of a freeman with his hand or with a cudgel, let him pay a penalty of three hundred coins If he has broken the bone of a slave, let him have one hundred and fifty coins. If one is guilty of insult, the penalty shall be twenty-five coins. 2. If a slave shall have committed theft or done damage with his master"s knowledge, the action for damages is in the slave's name. The Twelve Tables is the earliest attempt by the Romans to create a Code of Law and is also the earliest (surviving) piece of literature coming from the Romans. In the midst of a perennial struggle for legal and social protection and civil rights between the privileged class (patricians) and the common people (plebeians) a commission of ten men (Decemviri) was appointed (ca. 455 B.C.) to draw up a code of law which would be binding on both parties and which the magistrates (the 2 consuls) would have to enforce impartially. The commission produced enough statutes (most of them were already 'customary law' anyway) to fill Ten Tablets, but this attempt seems not to have been entirely satisfactory especially to the plebeians. A second commission of ten was therefore appointed (450 B.C.) and two additional tablets were drawn up. The originals, said to have been inscribed on bronze, were probably destroyed when the Gauls sacked and burned Rome in the invasion of 387 B.C. The Twelve Tables give the student of Roman culture a chance to look into the workings of a society which is still quite agrarian in outlook and operations, and in which the main bonds which hold the society together and allow it to operate are: the clan (genos, gens), patronage (patron/client), and the inherent (and inherited) right of the patricians to leadership (in war, religion, law, and government). The Law of the Twelve Tablets (Latin: Leges Duodecim Tabularum or, informally, Duodecim Tabulae) was the ancient legislation that stood at the foundation of Roman law. The Law of the Twelve Tables formed the centerpiece of the constitution of the Roman Republic and the core of the mos maiorum (custom of the ancestors). The Twelve Tables must be distinguished from the unrelated - and much older - "twelve shields" of King Numa Pompilius. The Twelve Tables came about as a result of the long social struggle between patricians and plebeians. After the expulsion of the last king of Rome, Tarquinius Suberbus, the Republic was governed by a hierarchy of magistrates. Initially only patricians were eligible to become magistrates and this, among other plebeian complaints was a source of discontent for plebeians. In the context of this unequal status, plebeians would take action to secure concessions for themselves using the threat of secession. They would threaten to leave the city with the consequence that it would grind to a halt, as the plebeians were Rome's labour force. 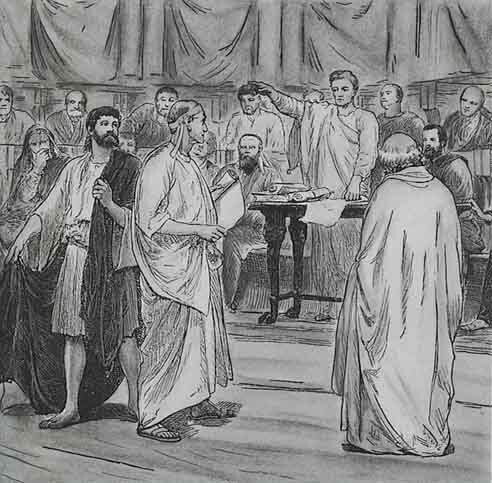 One of the most important concessions won in this class struggle was the establishment of the Twelve Tables, establishing basic procedural rights for all Roman citizens as against one another. 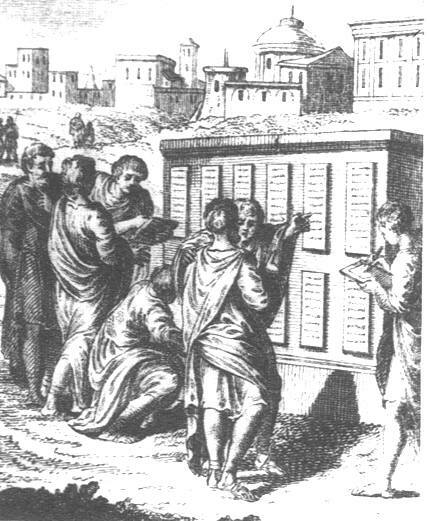 Patricians long opposed this request, but around 451 BC, the first decemviri (decemvirate - board of "Ten Men") was appointed to draw up the first ten tables. They allegedly sent an embassy to Greece to study the legislative system of Athens, known as the Solonian Constitution, but also to find out about the legislation of other Greek cities. Modern scholars believe the Roman assembly most likely visited the Greek cities of Southern Italy, and did not travel all the way to Greece. In 450 B.C., the second decemviri started work on the last two tables. In 449 BC, the second decemvirate completed the last two codes, and after a secessio plebis to force the Senate to consider them, the Law of the Twelve Tables was formally promulgated. The Twelve Tables were drawn up on twelve ivory tablets (Livy says bronze) which were posted in the Roman Forum so all Romans could read and know them. It was not a comprehensive statement of all law, but a sequence of definitions of various private rights and procedures. They generally took for granted such things as the institutions of the family and various rituals for formal transactions. For such an important document, it is somewhat surprising that the original text has been lost. The original tablets were destroyed when the Gauls under Brennus burnt Rome in 390 BC. There was no other official promulgation of them to survive, only unofficial editions. What we have of them today are brief excerpts and quotations from these laws in other authors. They are written in a strange, archaic, laconic, and somewhat childish and sing-song version of Latin (described as Saturnian verse). As such, though we cannot tell whether the quoted fragments accurately preserve the original form, what we have gives us some insight into the grammar of early Latin. The belief is that the text was written as such so plebians could more easily memorize the laws, as literacy was not commonplace during early Rome. Many laws include Lex Canuleia (445 BC; which allowed the marriage - ius connubii - between patricians and plebeians), Leges Licinae Sextiae (367 BC; which made restrictions on possession of public lands - ager publicus - and also made sure that one of consuls is plebeian), Lex Ogulnia (300 BC; plebeians received access to priest posts), and Lex Hortensia (287 BC; verdicts of plebeian assemblies - plebiscita - now bind all people). Traditionally, the origins of Roman legal science are connected to Gnaeus Flavius. Flavius is said to have published around the year 300 BC the formularies containing the words which had to be spoken in court to begin a legal action. Before the time of Flavius, these formularies are said to have been secret and known only to the priests. Their publication made it possible for non-priests to explore the meaning of these legal texts. Whether or not this story is credible, jurists were active and legal treatises were written in larger numbers the 2nd century BC. Among the famous jurists of the republican period are Quintus Mucius Scaevola who wrote a voluminous treatise on all aspects of the law, which was very influential in later times, and Servius Sulpicius Rufus, a friend of Marcus Tullius Cicero. Thus, Rome had developed a very sophisticated legal system and a refined legal culture when the Roman republic was replaced by the monarchical system of the principate in 27 BC. Thus, over the course of time, parallel to the civil law and supplementing and correcting it, a new body of praetoric law emerged. Ultimately, civil law and praetoric law were fused in the Corpus Juris Civilis. The first 250 years of the current era are the period during which Roman law and Roman legal science reached the highest degree of perfection. The law of this period is often referred to as classical period of Roman law. The literary and practical achievements of the jurists of this period gave Roman law its unique shape. By the middle of the 3rd century, the conditions for the flourishing of a refined legal culture had become less favourable. The general political and economic situation deteriorated as the emperors assumed more direct control of all aspects of political life. The political system of the principate, which had retained some features of the republican constitution, began to transform itself into the absolute monarchy of the dominate. The existence of a legal science and of jurists who regarded law as a science, not as an instrument to achieve the political goals set by the absolute monarch, did not fit well into the new order of things. The literary production all but ended. Few jurists after the mid-3rd century are known by name. While legal science and legal education persisted to some extent in the eastern part of the Empire, most of the subtleties of classical law came to be disregarded and finally forgotten in the west. Classical law was replaced by so-called vulgar law. Where the writings of classical jurists were still known, they were edited to conform to the new situation. jus civile, Jus gentium, and jus naturale - the jus civile ("citizen law", originally jus civile Quiritium) was the body of common laws that applied to Roman citizens and the Praetores Urbani, the individuals who had jurisdiction over cases involving citizens. The jus gentium ("law of peoples") was the body of common laws that applied to foreigners, and their dealings with Roman citizens. The Praetores Peregrini were the individuals who had jurisdiction over cases involving citizens and foreigners. Jus naturale was a concept the jurists developed to explain why all people seemed to obey some laws. Their answer was that a "natural law" instilled in all beings a common sense. Jus scriptum and jus non scriptum - the terms jus scriptum and ius non scriptum literally mean written and unwritten law, respectively. In practice, the two differed by the means of their creation and not necessarily whether or not they were written down. The ius scriptum was the body of statute laws made by the legislature. The laws were known as leges (lit. "laws") and plebiscita (lit. "plebiscites," originating in the Plebeian Council). Roman lawyers would also include in the ius scriptum the edicts of magistrates (magistratuum edicta), the advice of the Senate (Senatus consulta), the responses and thoughts of jurists (responsa prudentium), and the proclamations and beliefs of the emperor (principum placita). Ius non scriptum was the body of common laws that arose from customary practice and had become binding over time. ius commune and ius singulare - Ius singulare (singular law) is special law for certain groups of people, things, or legal relations (because of which it is an exception from the general principles of the legal system), unlike general, ordinary, law (ius commune). An example of this is the law about wills written by people in the military during a campaign, which are exempt of the solemnities generally required for citizens when writing wills in normal circumstances. ius publicum and ius privatum - ius publicum means public law and ius privatum means private law, where public law is to protect the interests of the Roman state while private law should protect individuals. In the Roman law ius privatum included personal, property, civil and criminal law; judicial proceeding was private process (iudicium privatum); and crimes were private (except the most severe ones that were prosecuted by the state). Public law will only include some areas of private law close to the end of the Roman state. Ius publicum was also used to describe obligatory legal regulations (today called ius cogens - this term is applied in modern international law to indicate peremptory norms that cannot be derogated from). These are regulations that cannot be changed or excluded by party agreement. Those regulations that can be changed are called today jus dispositivum, and they are not used when party shares something and are in contrary. In Roman law, status describes a person's legal status. 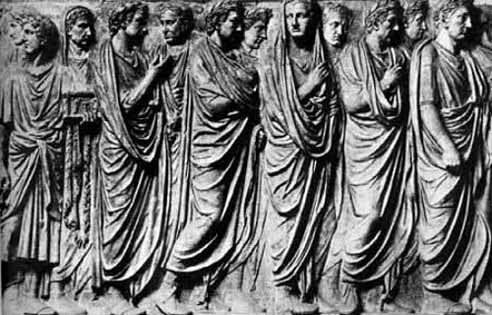 The individual could be a Roman citizen (status civitatis), unlike foreigners; or he could be free (status libertatis), unlike slaves; or he could have a certain position in a Roman family (status familiae) either as head of the family (pater familias), or as a lower member (filii familias). In the Roman state, according to Roman civil law (ius civile), only Roman citizens had the full civil and political rights. In regard to status civitatis, in the Roman state, there were cives, Latini and peregrini, and foreigners. Outside the Roman state, there were externi, barbari and hosts. Status familiae is the legal status of an individual in the family. The pater familias had the authority in the family (patria potestas), and everyone was subjected to him based on adgnatio (kinship only from father's side). This had an impact in private law. There is a distinction between alieni iuris (persons under patria potestas) and sui iuris (persons autonomous of patria potestas, who could only be the pater familias himself). Filius familias had ius suffragii and ius honorum, but in the area of private law he was restricted because of patria potestas. The social and legal status of slaves in the Roman state was different in different epochs. In the time of old civil law (ius civile Quiritium) slavery had a patriarchal shape (a slave did the same job and lived under the same conditions as his master and family). 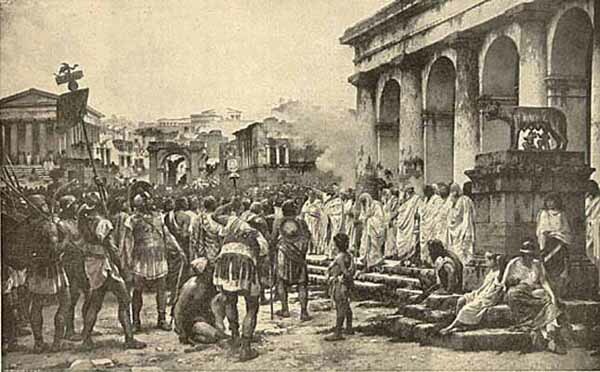 After Rome's victorious wars, from the third century BC, huge numbers of slaves came to Rome, and that resulted in slave trade and increased exploitation of slaves. From that time on, a slave became only a thing (res)- servi pro nullis habentur. The legal state of slaves was based on the fact that the slave was not a subject but an object of law. A master had the right of ownership over the slave. He could sell him, give him in pawn but certainly could not harm or kill him. If someone injured his slave, a master could initiate legal proceedings and demand protection. The ownership over the slave was called dominica potestas, and not dominium like the ownership of objects and animals. In the Roman legal system, a slave did not have a family. His sexual relationships with other slaves was not marriage (matrimonium), but a cohabitation (contubernium), without legal consequences. Masters could also give over a certain amount of property (such as land, buildings), known as peculium, to a slave for his management and use. This peculium was protected under Roman law and inaccessible by the owner. This was another tool a slave could use to purchase their freedom. The oldest means of becoming a slave was to be captured as an enemy in war. However, even a foreigner could become free again and even a Roman citizen could become a slave. Slavery was hereditary, and the child of a slave woman became a slave no matter who the father was. However, according to classical law, a child of a slave became free (ingenuus), if her mother was free, even for a short period of time, during the pregnancy. After the Punic wars, Rome started the mass exploitation of slaves. However, the development of industry, trade and other branches of economy required skilled free workers that took interest in their jobs. A slave could get free by the act of manumission, by which a master would release him from his authority. Manumissions were different in different epochs. According to Roman law, slaves that were freed (libertinus, in regard to his master libertus) became Roman citizens, but they had many fewer rights than Roman citizens that were born free (ingenuus). The slave's former master now became his patron (patronus), and the libertus still had obligations towards him (this was regulated by law). The libertus had to be obedient and respectful to his patron (obsequium et reverentia). The patron could punish a disobedient libertus, In older times he could even kill him (ius vitae necisque), but later he could not. In some circumstances he could even ask a magistrate to turn the libertus into a slave once again (accusatio ingrati). When the centre of the Empire was moved to the Greek East in the 4th century, many legal concepts of Greek origin appeared in the official Roman legislation. The influence is visible even in the law of persons or of the family, which is traditionally the part of the law that changes least. For example Constantine started putting restrictions on the ancient Roman concept of patria potestas, the power held by the male head of a family over his descendents, by acknowledging that persons in potestate, the descendents, could have proprietary rights. He was apparently making concessions to the much stricter concept of paternal authority under Greek-Hellenistic law. The Codex Theodosianus (438 AD) was a codification of Constantian laws. Later emperors went even further, until Justinian finally decreed that a child in potestate became owner of everything it acquired, except when it acquired something from its father. In the west, Justinian's political authority never went any farther than certain portions of the Italian and Hispanic peninsulas. Law codes were edicted by the Germanic kings, however, the influence of early Eastern Roman codes on some of these is quite discernible. In many early Germanic states, ethnic Roman citizens continued to be governed by Roman laws for quite some time, even while members of the various Germanic tribes were governed by their own respective codes. The Code and the Institutes of Justinian were known in Western Europe, and along with the earlier code of Theodosius II, served as models for a few of the Germanic law codes; however, the Digest portion was largely ignored for several centuries until around 1070, when a manuscript of the Digest was rediscovered in Italy. This was done mainly through the works of glossars who wrote their comments between lines (glossa interlinearis), or in the form of marginal notes (glossa marginalis). From that time, scholars began to study the ancient Roman legal texts, and to teach others what they learned from their studies. The center of these studies was Bologna. The law school there gradually developed into one of Europe's first universities. The students who were taught Roman law in Bologna (and later in many other places) found that many rules of Roman law were better suited to regulate complex economic transactions than were the customary rules, which were applicable throughout Europe. For this reason, Roman law, or at least some provisions borrowed from it, began to be re-introduced into legal practice, centuries after the end of the Roman empire. This process was actively supported by many kings and princes who employed university-trained jurists as counselors and court officials and sought to benefit from rules like the famous Princeps legibus solutus est ("The sovereign is not bound by the laws", a phrase initially coined by Ulpian, a Roman jurist). By the middle of the 16th century, the rediscovered Roman law dominated the legal practice in a lot of European countries. A legal system, in which Roman law was mixed with elements of canon law and of Germanic custom, especially feudal law, had emerged. This legal system, which was common to all of continental Europe (and Scotland) was known as Ius Commune. This Ius Commune and the legal systems based on it are usually referred to as civil law in English-speaking countries. Only England did not take part in the wholesale reception of Roman law. One reason for this is that the English legal system was more developed than its continental counterparts by the time Roman law was rediscovered. Therefore, the practical advantages of Roman law were less obvious to English practitioners than to continental lawyers. As a result, the English system of common law developed in parallel to Roman-based civil law, with its practitioners being trained at the Inns of Court in London rather than receiving degrees in Canon or Civil Law at the Universities of Oxford or Cambridge. Elements of Romano-canon law were present in England in the ecclesiastical courts and, less directly, through the development of the equity system. In addition, some concepts from Roman law made their way into the common law. Especially in the early 19th century, English lawyers and judges were willing to borrow rules and ideas from continental jurists and directly from Roman law. The practical application of Roman law and the era of the European Ius Commune came to an end, when national codifications were made. In 1804, the French civil code came into force. In the course of the 19th century, many European states either adopted the French model or drafted their own codes. In Germany, the political situation made the creation of a national code of laws impossible. From the 17th century Roman law, in Germany, had been heavily influenced by domestic (common) law, and it was called usus modernus Pandectarum. In some parts of Germany, Roman law continued to be applied until the German civil code (Burgerliches Gesetzbuch, BGB) came into force in 1900. Colonial expansion spread the civil law system and European civil law has been adopted in much of Latin America as well as in parts of Asia and Africa. steps towards a unification of the private law in the member states of the European Union are being taken, the old Ius Commune, which was the common basis of legal practice everywhere, but allowed for many local variants, is seen by many as a model.